Sweet Potato Wedges with Cinnamon, Sugar and Honey, a delicious way to roast and oven bake up a perfect side dish that isn’t too sweet or too salty. 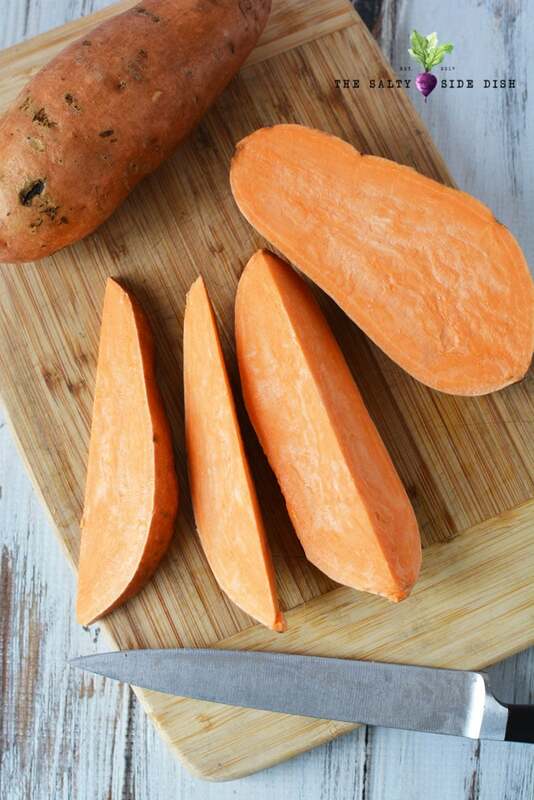 Roast up these sweet potatoes for a delicious and healthier version of a fry….kinda. Soon as you smother with honey, sugar, and cinnamon it becomes a major treat that isn’t too sweet to eat wedge after roasted wedge. 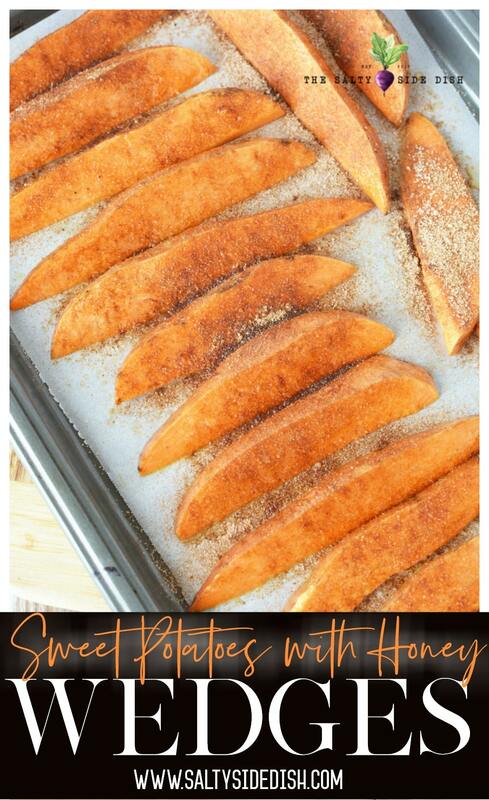 You can also throw a bit of salt on your sweet potatoes at the end to make the flavors burst! 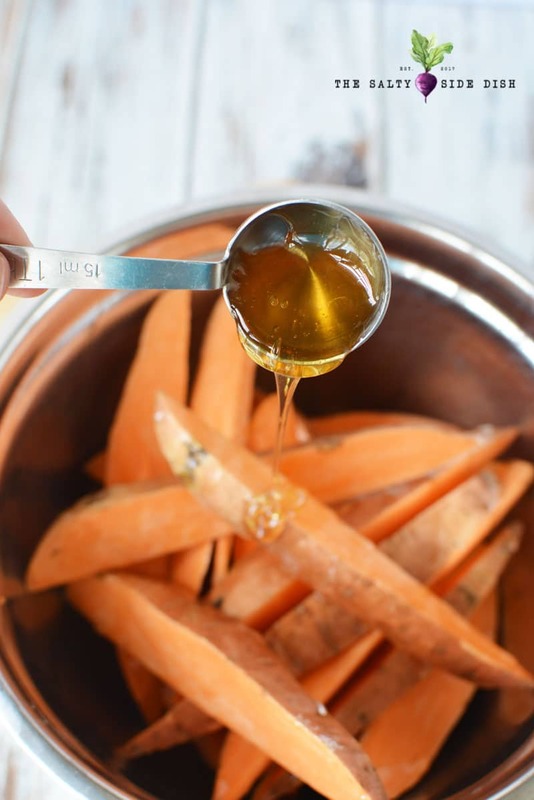 If you love sweet potatoes, there are so many great recipes to enjoy. 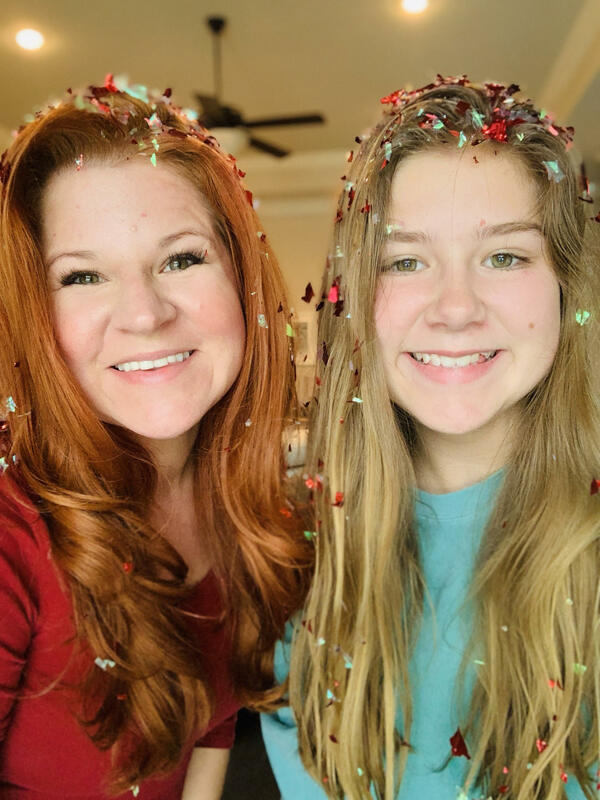 Make sure you try this sweet potato casserole, smothered in marshmallows! I sliced sweet potatoes in half, and then in quarters, and then cut the quarters of the potatoes again in half. They are still thick, but tasty. Preheat oven to 450 and line a baking pan with parchment paper . Spray the paper with nonstick cooking spray . Set aside. In a large bowl add sweet potato wedges. Stir in oil and honey and mix well to evenly coat. 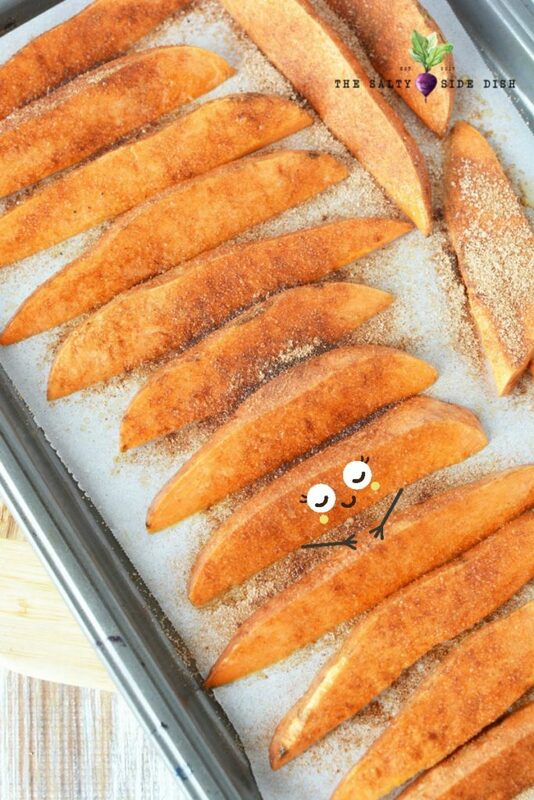 Place sweet potato wedges on prepared baking dish. In a small bowl add sugar, salt, cinnamon and nutmeg and mix well. Bake (roast) for 30 minutes, checking after 20 minutes to see if wedges are cooked through and not burnt. You might even want to turn down your oven to 400 degrees the last 5 minutes. As you can see, my sweet potatoes got a little crispy, but I like them that way! If desired, broil for 3-5 minutes to make the wedges even more crispy. 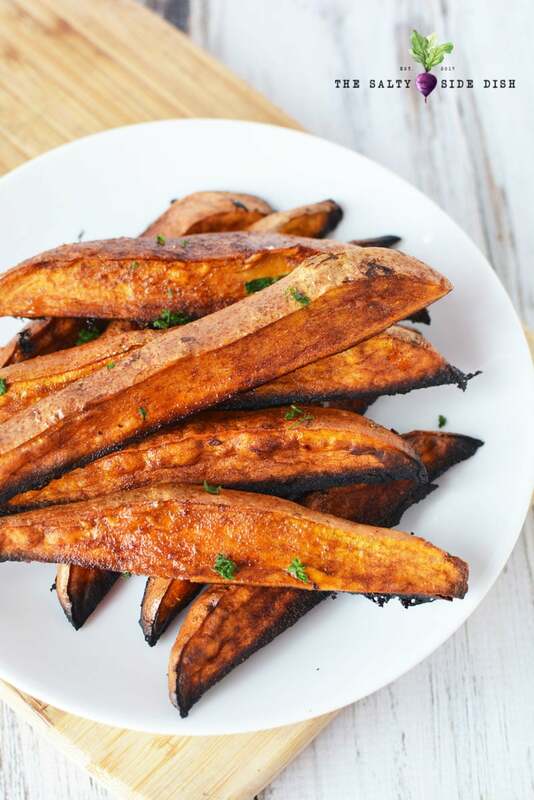 Sweet Potato Wedges with Cinnamon, Sugar and Honey, a delicious way to roast and oven bake up a perfect side dish that isn't too sweet or too salty. Preheat oven to 450 and line a baking pan with parchment paper. Spray the paper with nonstick cooking spray. Set aside. In a large bowl add sweet potato wedges. Stir in oil and honey and mix well to evenly coat. 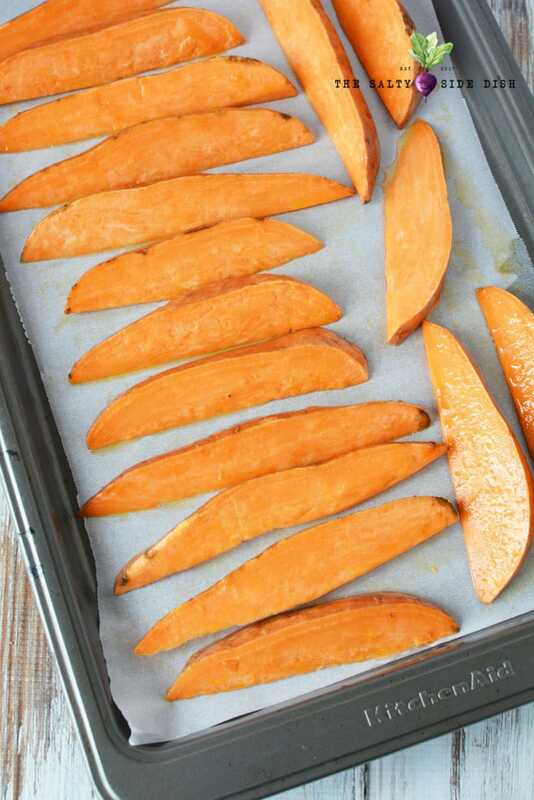 Place sweet potato wedges on prepared baking dish. In a small bowl add sugar, salt, cinnamon and nutmeg and mix well. Generously sprinkle over wedges. Bake for 30 minutes, checking after 20 minutes to see if wedges are cooked through and not burnt. If desired, broil for 3-5 minutes to make the wedges crispy. To Cut Sweet Potatoes: I sliced in half, and then in quarters, and then cut the quarters in half. They are still thick, but tasty.